As a 501(c)3 non-profit organization, Big Picture Philadelphia must raise funds to support the operations of our programs. Any donation to Big Picture Philadelphia is 100% tax-deductible. Big Picture Philadelphia works hard to keep our overhead low so that the support of our donors and funders can be maximized through our programs. We appreciate any and all donations. To make a donation to Big Picture Philadelphia, please click the PayPal button below! Now your company can support BPP students at their internships! 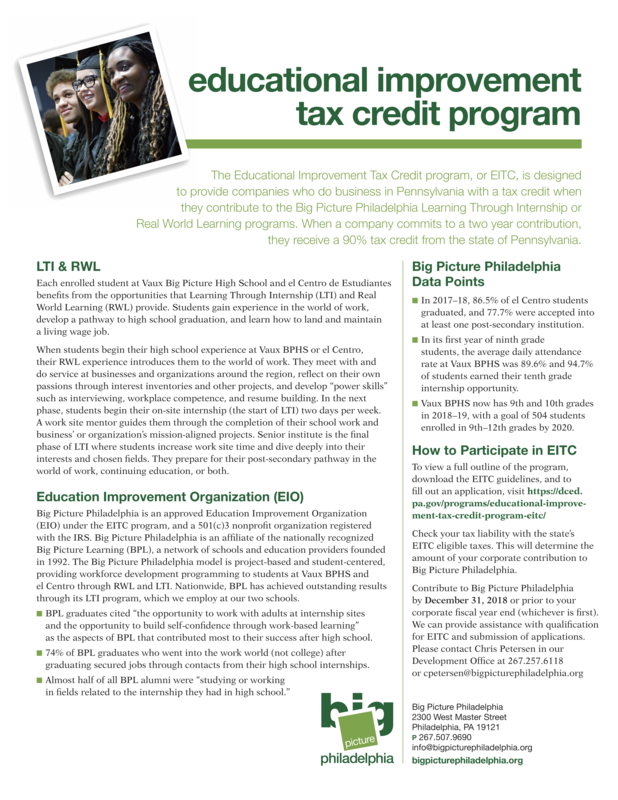 The Pennsylvania Educational Improvement Tax Credit Program (EITC) is designed to provide tax credits to companies who do business in Pennsylvania when they contribute to the Big Picture Philadelphia Real World Learning (RWL) and Learning Through Internship (LTI) programs. These programs prepare students for and place them in internships throughout the Philadelphia region, working alongside a Mentor at the work site. Corporate contributions are made directly to Big Picture Philadelphia and can provide up to a 90% tax credit to the company for a two year contribution. Considering a year-end contribution to Big Picture Philadelphia? Thank you for thinking of us! We receive financial contributions in several ways to support programs at Vaux Big Picture High School and el Centro de Estudiantes. Please note the details of how to contribute to our work in the PDF below.